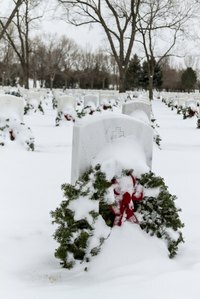 Share the holidays and honor your departed loved ones at the cemetery by hanging a Christmas wreath at their graves. Choose greenery, flowers and ornaments that you and your loved one enjoyed at Christmas to decorate the wreath so it is intimate and special. Fresh evergreens on lightweight wooden frames work in most areas, but wreaths that incorporate artificial greenery, ribbon or fabric can be used in warm-weather areas. Cut 8- to 18-inch pieces of evergreen. Mix the sizes and variety so that your wreath will vary in depth and color. Gather two to three pieces of greenery in your hand. Lay them together, all facing the same direction. Place them flat on the frame. Staple the stems to the frame with the staple gun. Use three to four staples to ensure all of the pieces are secured to the frame. Select another group of greenery and layer over the stems of the first bunch. Overlap the stems but not the entire pieces of greenery. Staple down as you did the first bunch. Keep repeating the steps above, layering and stapling as you make your way around the frame. It's OK if pieces stick out at this stage. Slide the last pieces of greenery under the first ones you stapled down in order to create a solid circle with no gap. Lift the greenery and staple. Prop the wreath up against the wall. Trim any wild pieces with the clippers. Cut longer pieces so they are within an inch of the pieces around them. The wreath should have a circular shape but should still feel organic, not forced. Clip the pieces on the inside of the wreath so there is a circular opening. Step back to look at the wreath to evaluate your work; rotate the wreath as you go to ensure you cut all sides. Tie a bow and secure with a piece of wire. The bow can be placed at the top or bottom of the wreath as well as in the four or five o’clock position. Decorate with your preferred notions including ribbon, silk flowers, ornaments, berries or fruit. Hang the wreath. Use a wide piece of ribbon to hang on the headstone. Stick a suction hook on the back and run the ribbon from the hook, through the middle of the wreath and back to the hook over the top of the stone. Run a U-shaped piece of wire through the frame of the wreath to stake it to the ground next to a grave with the engraved plates. Wire the frame to a mini garden-flag stand and stick into the ground near the grave. Ask local Christmas tree lots for remnant clippings. They may give you the bottom branches they remove from the trees. Use the same process with a wire frame, florist wire and artificial greenery for locations with warmer climates. Check the cemetery’s regulations for grave site decorations before you make your wreath.